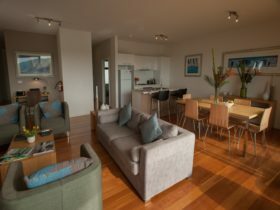 Aireys Inlet Getaway Resort is your ideal, comfortable, stylish, self-catered, beach holiday accommodation. 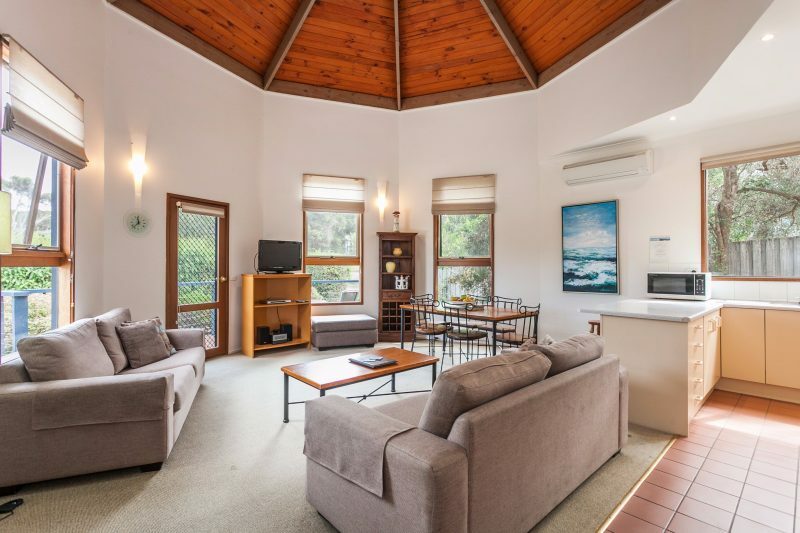 It is located on the beach side of the world famous and spectacular Great Ocean Road in the beautiful and picturesque coastal hamlet of Aireys Inlet. 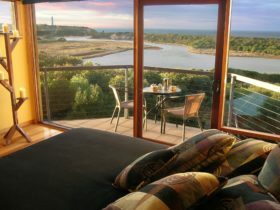 Aireys Inlet Getaway Resort is a 75 minute drive South-West of Melbourne, and only 400 metres walk from the beach. 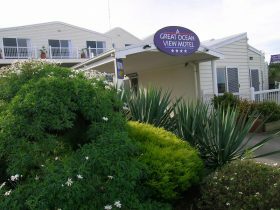 The resort is a wonderful place to stay, relax, and explore the ruggedly beautiful, wide open beaches of Victoria’s magnificent Surf Coast. 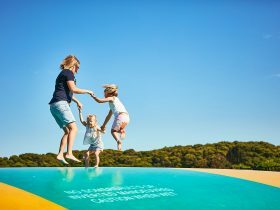 Aireys Inlet Getaway Resort is set within two and a half acres of beautiful gardens and native wildlife, with a tennis court, swimming pool and heated outdoor spa, children’s play area, picnic tables and barbecue facilities. 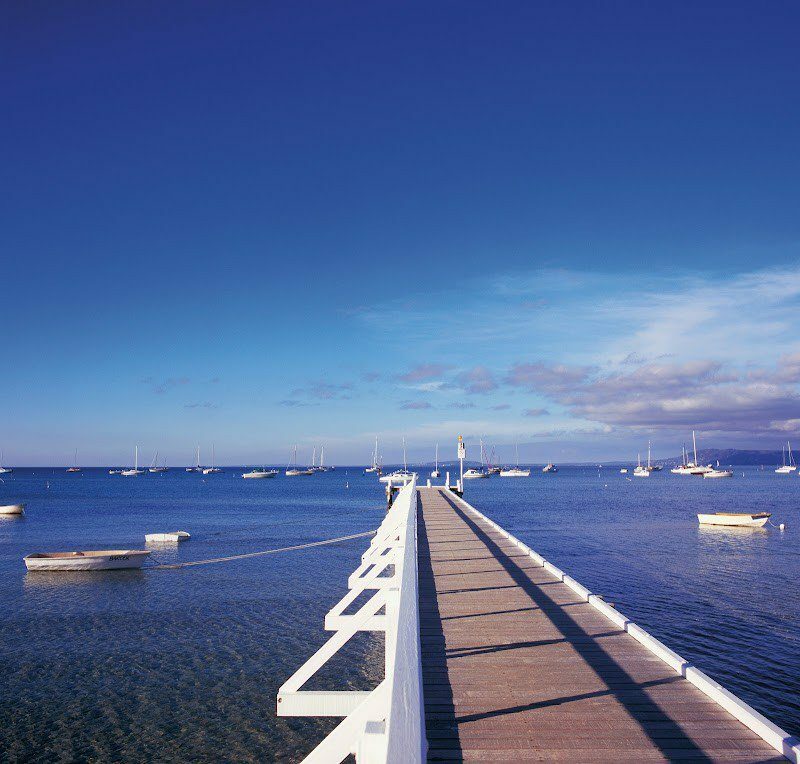 The gorgeous four star boutique resort has a genuinely warm and personal touch. The accommodation, comprises of three two-bedroom deluxe spa villas, three three-bedroom family villas, two two-bedroom family villas and three stylish, open plan studio apartments. Please note, there is a noise curfew after 10:00 pm every night, this ensures all guests have a great rest. For any further information please contact Airey`s Inlet Getaway Resort or see their website. The two bedroom family villa sleeps up to five people. Bedding consists of one queen bed and two single beds plus a trundle bed, reverse cycle air-conditioning, bath and separate shower, deck with table and chairs. There is parking available opposite villa. The villa is suitable for young families with children from infant to 12 years old. The two bedroom family villa that also allows pets. Must ask at time of booking and is at the discretion of management. Sleeps up to five. Bedding consists of one queen bed and two single beds plus a trundle bed, gas log fire, large corner spa, fenced off yard, outdoor setting on front deck. Parking is available opposite the villa. The three bedroom family villa sleeps up to six in two queen beds and two single beds. 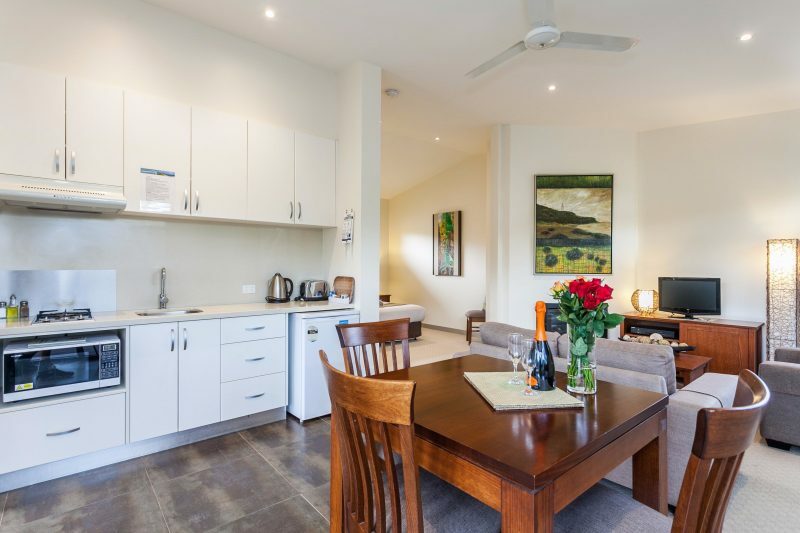 The Villa’s features include: gas log fire, reverse cycle air conditioning in all bedrooms as well as kitchen and living area, spa bath and separate shower, full cooking facilities, dishwasher and laundry. There is an outdoor decking area with table and chairs and private carport. The two bedroom deluxe spa villa consists of one king bed on a mezzanine level and two king single beds, or a king zipped together, gas log fire, reverse cycle air conditioning, large corner spa. Full kitchen and laundry facilities are also on offer with separate shower and spa. Outdoor setting on deck, parking at villa. The three bedroom family villa contains two queen beds and two single beds, sleeping a total of six people. 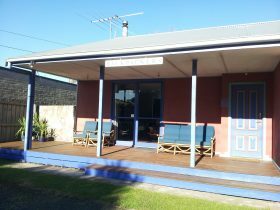 The Villa features a gas log fire, reverse cycle air conditioning in the kitchen and lounge area, bath and separate shower, Foxtel , DVD, television, dishwasher, outdoor decking with outdoor setting on grassed area and private carport. The one bedroom stylish studio sleeps up to two people. 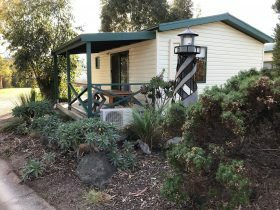 The studio features one queen bed, gas log fire, reverse cycle air-conditioning, deep bath, separate shower, washing machine, dryer, kitchenette, with gas hot plates and a convection microwave and bar fridge, outdoor setting on deck. Parking is available next to the studio. The three bedroom family villa sleeps up to seven people. The villa consists of two queen beds, two single beds and a trundle bed. 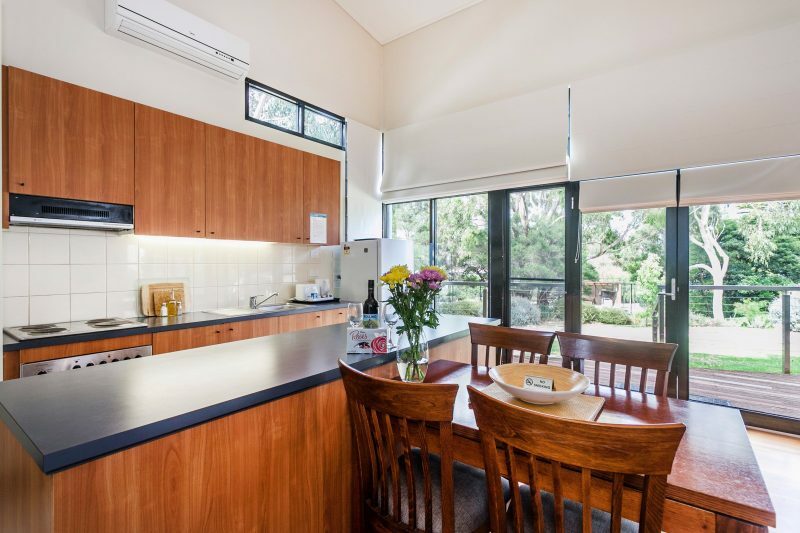 The villa features a gas log fire and reverse cycle air-conditioning in the kitchen lounge area, bath and separate shower, full kitchen and laundry. There is an outdoor setting with table and chairs and private carport. Prices range from Studio s that sleep two to three bedroom villas that sleeps six. Also time of year- low – medium or high season.